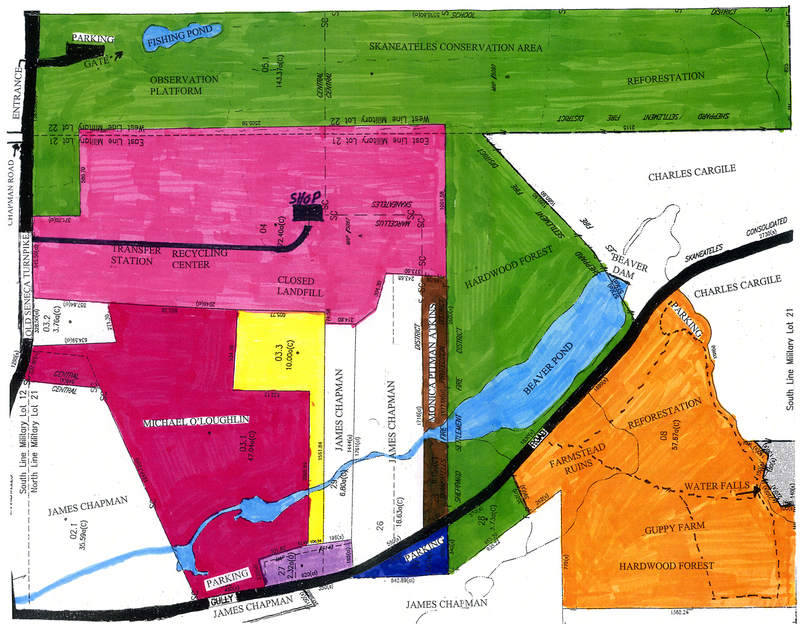 The following Record of Acquisitons for The Skaneateles Conservation Area was provided with permission by Bill Pavlus. The referenced map and color key are at the bottom of this page. The Skaneateles Conservation Area is located south of Old Seneca Turnpike and along both sides of Gully Road in the area of the Beaver Pond. Including the Transfer Station this parcel contains 345.42 acres. Several different transactions have taken place to acquire this property. You have a color-coded map of the area on the opposite side. I will now walk you through the various acquisitions as listed in the Key on the right hand side of the map. We will first visit the area, coded Purple. Please note the dash lines, which indicate the four purchases that make up this one parcel. In the 1930’s or perhaps even before, the Town of Skaneateles purchased a small piece of land along Gully Road from the Chapman family. [The survey map for this 220-ft. x 195-ft. parcel dates the transfer from Uriah Chapman & Wife to the Town of Skan. on June 6, 1941. – ed.] This first purchase is on the right hand side and was to be used for the disposal of trash generated, mostly by village residents. During that period, most rural residents disposed of what little trash they had, on their own property. In those days, Gully Road was a dirt road and nobody lived in that area, so it seemed like the right thing to do. As the area for dumping trash filled up, a second and third parcel were purchased, to the north of the original section, from the Fitzgerald family. When dumping at this location came to an end, it was necessary to make the fourth acquisition of property which provided sufficient land around the dump to allow for proper covering as mandated by the NYS Department of Environmental Conservation. In 1969 I volunteered to help try to find a location for a landfill operation to replace the old dump. As a neighbor, I was aware of the fact that the U. S. Department of Agriculture was no longer using their Experimental Station, (Federal Farm), on Old Seneca Turnpike. With the help of Councilman Bob Baumgartner and Town Attorney, Jack Bryant we enlisted the aid of Congressman James Hanley to see if we could acquire that property. After some lengthy negotiation, we received word that we would receive, as a gift, the entire 219.5 acre farm. Before the transaction could be finalized, a young reporter, J. Michael Kelly, residing in Marcellus, objected, stating that a landfill on this farm could allow leachate to flow down grade into a feeder stream to Nine Mile Creek which flows through the Village of Marcellus. Congressman Hanley also represented the residents of Marcellus, so it didn’t take long for him to withdraw his support of our deal. However, we were able to purchase 72 acres for $22,000.00. This is the large Pink parcel on your map and is the site of our present Transfer Station. During the short period of time that we have owned this parcel, it has served our community in many different ways. To begin, a site for a landfill was selected and a drainage ditch was dug around the site to divert all surface water from entering. Several test wells at varying depths were dug around the entire perimeter of the site, with a testing schedule to alert for any possible contamination. The operation began with trash being dumped into a cell, compacted and covered daily. When a cell became full another cell was started beside it. When the first level was full a second level was started over the first etc. This system is much like building a honeycomb. The landfill has been closed, sealed and plastic vent piping installed to permit the escape of methane gases. DEC requires an annual Post Closure Monitoring Report to be submitted by an engineering firm. This report costs over $10,000.00 annually. Our next operation was the installation of an incinerator, which was used for only a few years. It took a well-trained person to operate the incinerator. Garbage was pushed into a chute and a ramrod pushed the trash into the burn chamber where it was ignited by a fuel oil fired burner. There were after burners in the smokestack to maintain proper stack temperature. It was very important to load the burn chamber with a proper charge. If the charge were too small or too large it would not bum completely and leave too much ash. The burn chamber had to be opened occasionally and the ash pulled out onto a cement pad and extinguished before being placed in the landfill. This operation soon became too costly to operate. When the Onondaga County Resource Recovery Agency (OCRRA) was created, Skaneateles was the only town in Onondaga County that refused to join forces with the county. This left us to find another way to dispose of our garbage. By now Seneca Meadows was in operation and we contracted with them to accept our garbage. It wasn’t long after this that Recycling began to become an environmentally popular way of life, so I again volunteered to help encourage our residents to recycle. Some people may remember that this started with the firemen having one trailer., at the Transfer Station, for the collection of old newsprint. As we found a market for an item, another trailer was added to the lineup. At one time I believe that we had in excess of ten trailers in a line. All recycled material had to be clean and baled individually in order to be marketable. This was very labor intensive, and costly. In the late 1990’s we had an opportunity to apply for a 50% refund on a building constructed to improve our recycling effort. Our employees helped design the present recycling building to replace all of the trailers. This building has been working out very well. Our efforts have not gone unnoticed because in 1998 we received “The Governor’s Award for Excellence” for our recycling efforts. The ten-acre parcel in Yellow was purchased from the Fitzgerald family to settle a potential claim, and to provide space for a hiking trail between the present Transfer Station and Gully Road. It will soon be developed. Next we have the two and a half-acre parcel in Blue on the west of Gully Road. Ralph and Mary Bishop owned this property. One day as I was driving on Gully Road I notice a son, Brock Bishop, cutting trees. I stopped to talk to him and suggested that after he logged it off, he consider donating it to the Town of Skaneateles, in memory of his parents, who had both passed away. A few days latter he stopped by Town Hall and told me that he would accept my suggestion. This gift was properly recorded in January of 1999. There is a long history to the parcel in Green. It is the 147 acres that remained of the old Federal Farm after our purchase of the large pink parcel. Originally, the Cayuga County B.O.C.E.S. picked it up, planning to use it for their educational program. That really never got off the ground. When they decided that it didn’t fit into their plans, they gave it up. At this point the Army Reserve acquired it, and used it basically for helicopter landing practice. It was used for practice landings for several years before it was listed as surplus property. Former Supervisor, Charlie Major helped maintain a close watch over this property during his term in office. Congressman James Walsh and his staff continued to watch over this property and when the army declared it surplus to their needs we resumed our efforts to acquire it. I must admit that at times I felt like giving up, however, one day Ginny Carmody, an assistant to Congressman Walsh suggested that perhaps I should contact Gretchen Ralph, an assistant to Senator Alfonse D’Amato. The weeks and months that followed generated lots of correspondence. One day I arrived in my office just in time to answer a phone call. The caller on the other end said, “This is Senator D’Amato and we’ve got your farm, I’ve chartered a plane and I’ll be flying into Skaneateles tomorrow, can you meet me at your airport?” Wow, what a surprise? There was a lot of scurrying around to gather up some gifts for the Senator. His plane arrived on schedule and Gretchen joined us for the greeting. We drove to the farm so that the Senator could see it. We took a lot of pictures, and presented our gifts. The Senator then gave each of us an autographed copy of a book that he had written, “Power, Pasta, and Politics.” The only thing that was missing was that he did not present us with a deed to the property. It seemed like an eternity and a lot more letters and phone calls before I received a call, from Congressman Walsh. He had the deed and would like to meet us at the farm for an official presentation. The date was June 25, 2001, my 74th birthday. Our attempt to acquire the farm started in 1969. It only took thirty-two years. On July 21, 2001 we held our first Annual Town of Skaneateles Fishing Derby on a small pond near the eastern edge of the property. A young boy scout by the name of Seamus Haggerty had been looking for a worthy project to earn his Eagle Scout Award. The land was not yet ours, however, we took a chance and during the early months of 2001 Seamus organized his work crew and with the pond frozen solid he cleared away enough brush and trees so that we could have our first Fishing Derby. Another scout, Joseph Zennamo, also earned an Eagle Award by clearing another small pond to the north, which was connected with a small waterway. We will forever be grateful to Seamus and Joseph for their efforts, which led us to seek a $6,000.00 grant from Assemblyman Will Barclay to deepen and connect the two ponds into one large pond where we hold an Annual Town of Skaneateles Fishing Derby. On January 18, 2002 we purchased the 57.67-acre, former Guppy Farm from Kathleen Evans, for $50,000. We received a the Clean Air, Clean Water Bond Act grant, through the New York State Office of Parks, Recreation and Historic Preservation, to cover fifty percent of the purchase price. This parcel is color-coded Orange. On November 10, 2005 we closed on the acquisition of 6.15 acres from Monica Pitman-Atkins. This property was important because the stream, where it flows through this property, is narrow enough for a boy scout to construct a bridge, as an Eagle Scout project, to allow for development of additional foot trails through the wooded area on the east side of the Beaver Pond. Again we must thank Assemblyman Will Barclay for securing $6,000.00 of the $10,000.00 purchase price. This addition is color-coded Brown. In 2005, $19,200 was received for timber sales from some of these properties. Our Conservation Area Committee contracted with Robert Davis, who is a certified Forester, to work with us on the layout of future trails, the selection of marketable trees, and assistance with marketing and contracting. Several marketable size trees were not cut because the committee wanted to preserve them for the viewing public to admire. These funds were deposited in a newly established Reserve Account earmarked for future acquisitions [for] this Conservation Area. On February 7, 2008 the Town Board conducted a Public Hearing on the purchase of the 47 acre, Michael O’loughlin property for $90,000. Several residents spoke in favor of the acquisition with on objections. This transaction is a big step forward in accomplishing our Long Range Goal for the Skaneateles Conservation Area and it is color-coded Rose. Purple This was the original town dump. It was acquired by 4 different purchases from the 1930’s to the 1970’s. The last purchase allowed space for cover material. This was ordered closed and approved by NYS DEC. Pink: This was purchased from the federal governtment in the early 1970’s for $22,000 to become the site for our new landfill. It is now the present transfer station and recycling center for the town of skaneateles. Yellow: This was purchased from the fitzgerald estate in 1989 for $7,000. Blue: This 2 acre parcel was logged off and then donated to the town in memory of Ralph & Mary Bishop, in June of 1998. Green: This 147 acres was received as a gift from the U.S. Army on June 25, 2001, thanks to Congressman Jim Walsh & Senator Alfonse D’Amato. Efforts to acquire this parcel started in 1969. Orange: The Guppy Farm was purchased from Kathleen Evans on January 18, 2002 for $50,000. A $25,000 grant was received from NYS Office Of Parks & Recreation. Brown: On November 10, 2005 the Monica Pitman-Atkins property was acquired for $10,000 with a grant of $6,000 from Assemblyman Will Barclay. Rose: In early 2008 the 47 acre O’Loughlin property was acquired for $90,000.